raster representing surface roughness. With high density data it is recommended to create this raster with the Simple ToPCAT Roughness Tool. grain size metrics are generally reported in millimeters so a conversion based on this value is performed to get values in millimeters . Polygon feature class representing areas of interest where the grain size metrics of D16, D50, D84, and D90 will be calculated for. Field in polygon feature class that will be used as a unique identifier to append the grain size metrics to the correct field. It is important that the value of this field is a unique for each record in the feature class. if this check box is selected then the number of raster cells used to calculate the grain size metrics will be appended to the channel unit polygon. 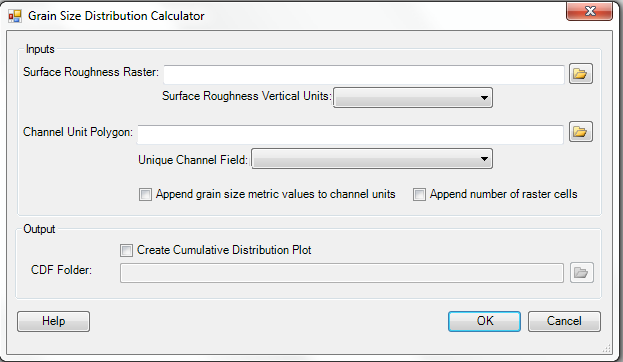 if this check box is selected then a cumulative distribution figure of the grain size distribution will be created for each polygon in the channel unit polygon.